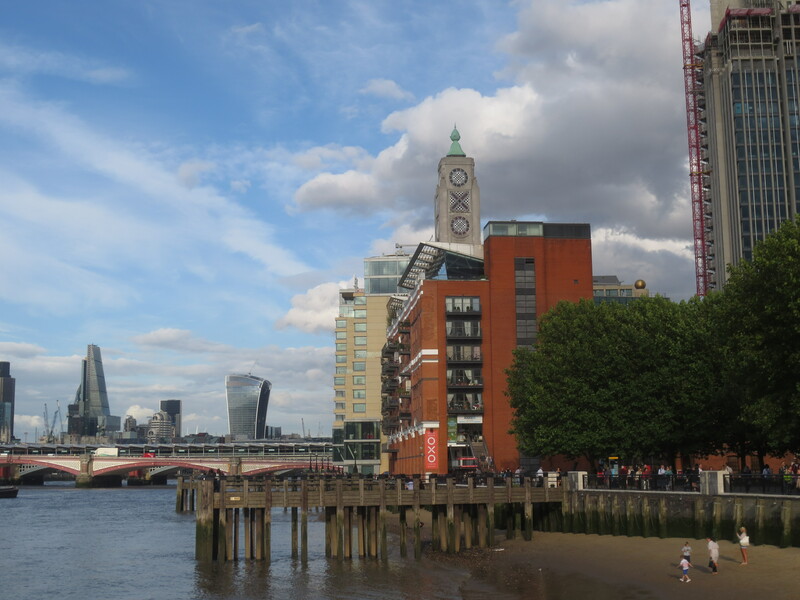 I hadn’t been to the Oxo Tower for years. We came to it via a circular route: I read about a good deal on Bookatable but then it turned out you either had to eat before 5pm or after 10. Mmm. Not very social hours. However, the seed laid, and the possibility discussed with Annie, we decided we both wanted to go anyway and would do a la carte. And Jerry came too, which was great, so it was the three of us. For me, it’s an easy 10-minute walk from Waterloo station to the Oxo Tower along the South Bank. 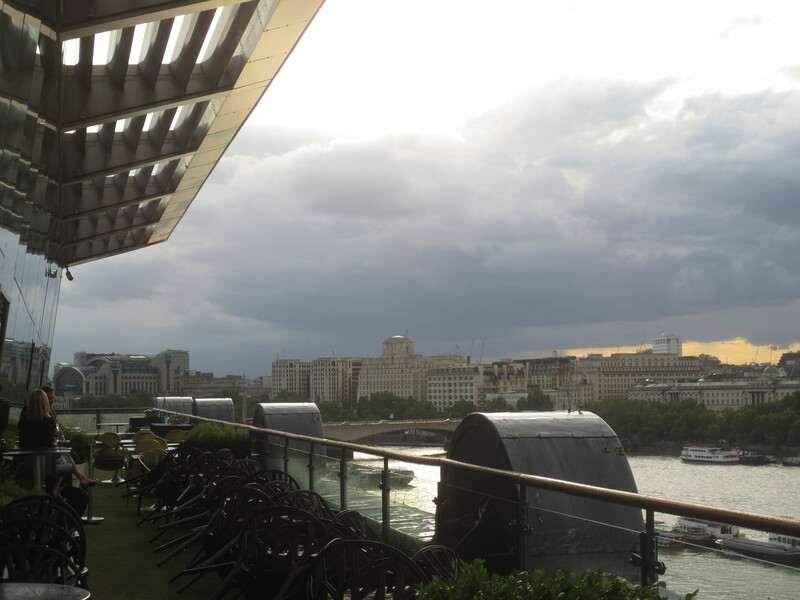 It’s a fun area with lots going on and lots to see but the heavens opened as I arrived, which seemed a shame when my restaurant choice for the night offered one of the best views in London. I went in early, not wanting to hang around outside in the bad weather, and when the rain died down, went out on to the balcony to take in that view. Well, it’s still pretty good! Even in bad weather. The restaurants are on the 8th floor: the Brasserie to one side of the lifts, the more formal Restaurant the other. There’s also a bar which was busy when I arrived with people obviously meeting there after work for cocktails. The brasserie was busy. It has the relaxed air you’d expect from the name: tables quite close together, things informal. But not the service. Right from the start the service was friendly and efficient; very professional. Orders for drinks were taken, excellent bread brought, pots of cold butter. Jerry suggested a bottle of a Lodi Old Vine Zinfadel from California for our wine: it was delicious, beautifully soft and smooth. We all chose different things for our starters. Jerry went for some bresaola with fried goats’ cheese, white peach and orange truffle honey; Annie for za’atar spiced quail. I was going to have the Parmesan panna cotta but made a last-minute switch to Middle Eastern Spiced Chickpea Salad. This looks quite spectacular (as did all dishes). 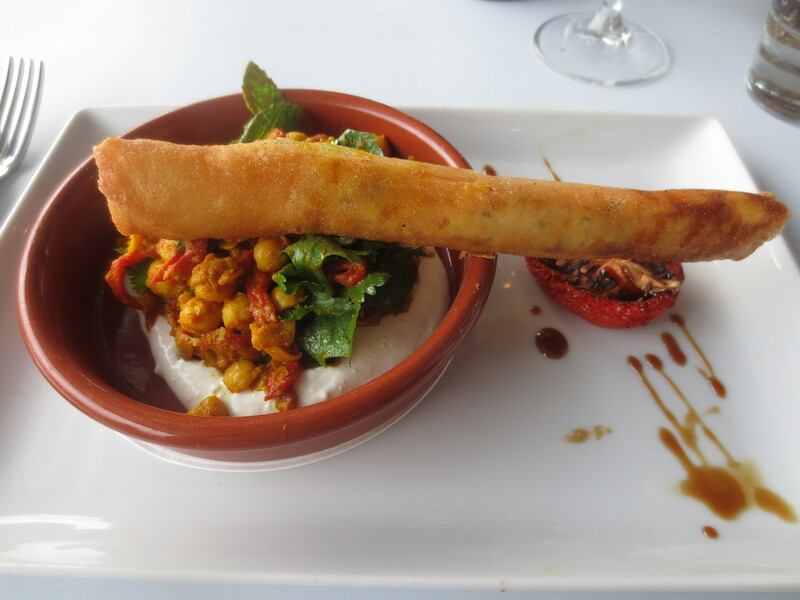 The chickpeas were on a bed of labneh; across the top lay a ‘brick’ which turned out to be a kind of thin, crispy pancake filled with ricotta. It was hot spicy; lots of chilli. But I like that so it was OK. The whole thing was wonderful and a great start to the meal. 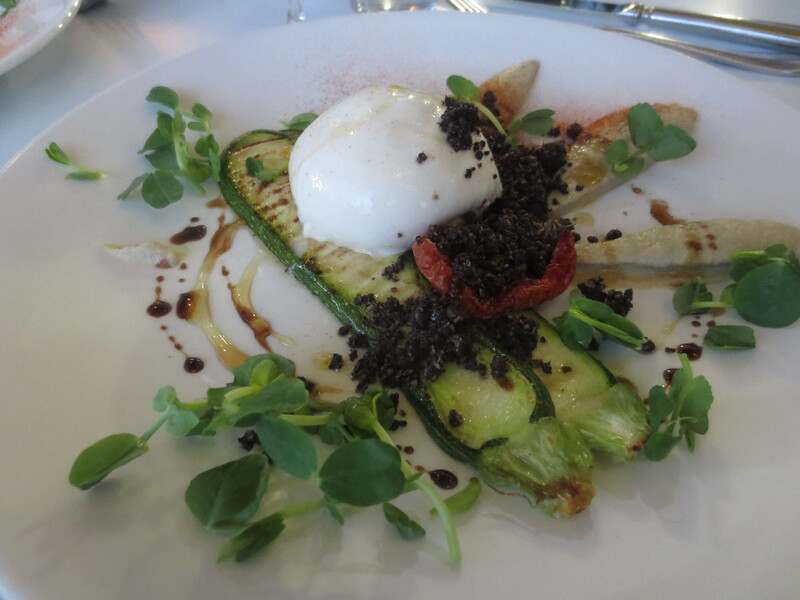 Annie and Jerry went vegetarian with their main course, choosing Buffalo milk burrata with aubergine, artichoke, courgette and black olive almond crumble. 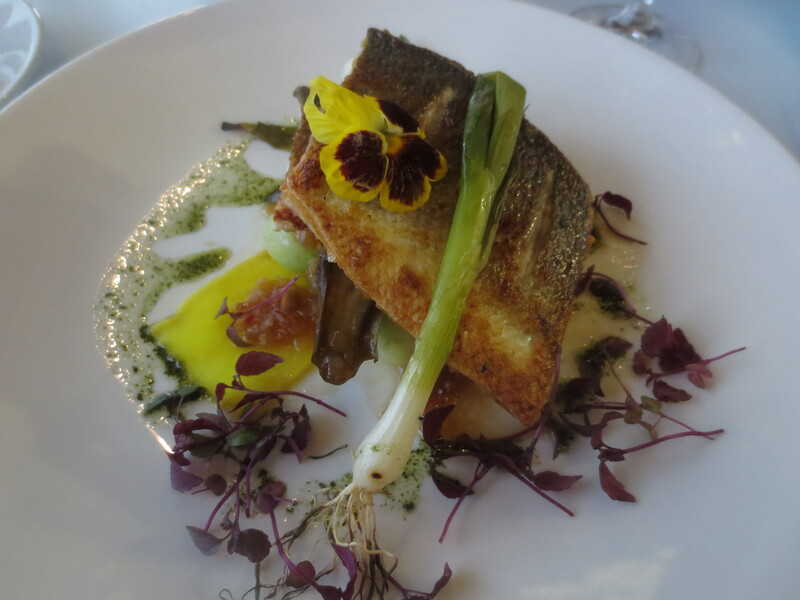 I chose fish, as I often do when I’m out; one of my very favourite kinds of fish – sea bass. This dish had an Asian influence with bak choy, aubergine, Enoki mushrooms, shallot ginger dressing and nori oil. This kind of flavouring goes really well with fish. The whole thing looked beautiful and this was definitely a time when the taste matched up to the promise in appearance. It was a fabulous dish. The fish was perfectly cooked with a crispy skin but gorgeously soft and tender inside. The accompaniments married beautifully, enhancing the flavour of the fish but not overwhelming its delicacy. Annie decided she was too full for dessert but thankfully Jerry wanted one so I didn’t have to feel guilty about going to a third course! I didn’t need anything else but the choices were so tempting! 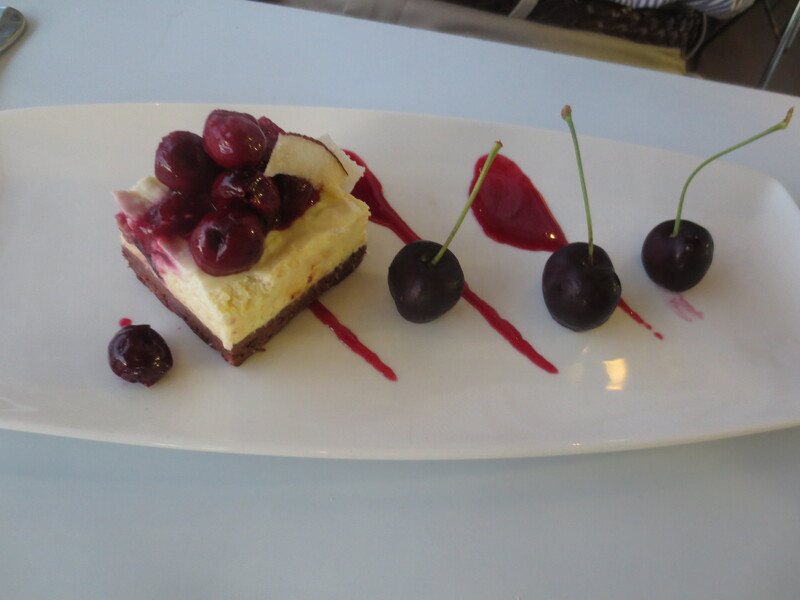 Jerry had White chocolate coconut cherry mouse, which looked a bit like a deconstructed Black Forest gateau. It was, Jerry said, very good. 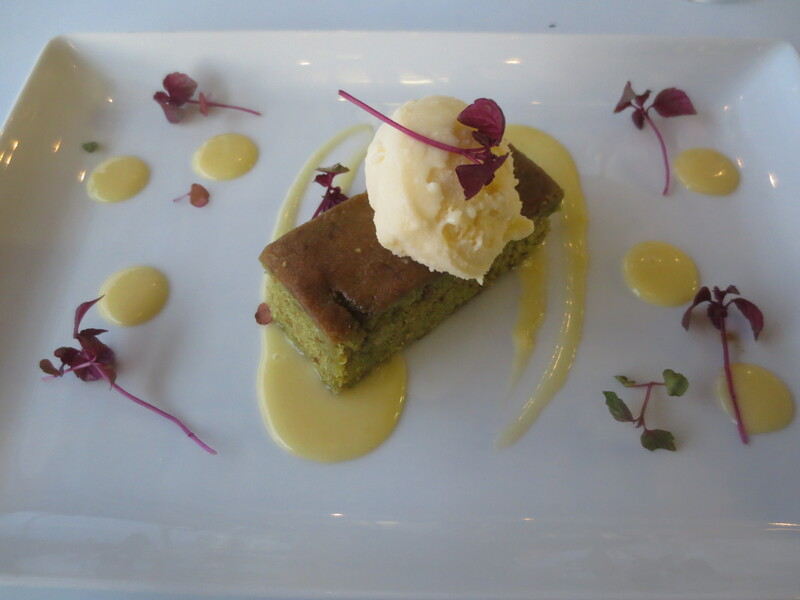 My choice was Green tea cake with kaffir lime leaf ice cream. It looked pretty but was unfortunately slightly disappointing. The cake a little dry and the whole thing not quite as wonderful and tasty as expected. But overall, we’d had a brilliant meal. And what a view from my seat! 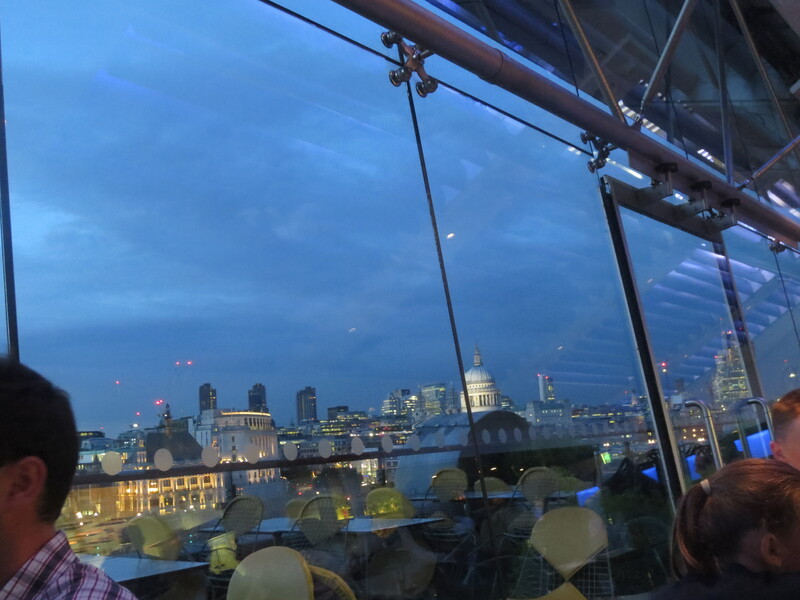 It really was spectacular: a clear view of St Paul’s and we’d also watched a lovely sunset. We finished with coffees and then went out on to the balcony on our way out to take in the view better. Not a very good quality photo, I’m afraid, but at least it gives you the idea! 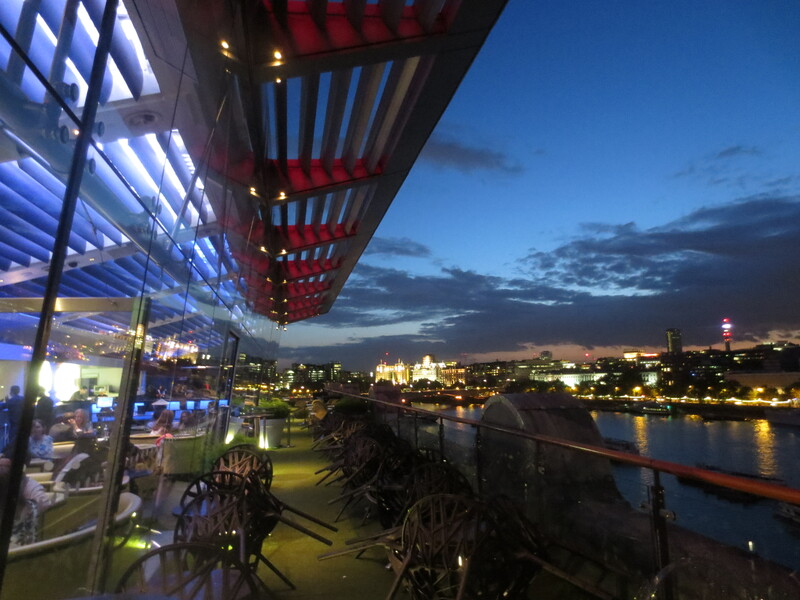 And shows that eating at the Oxo Tower is a brilliant experience when you can have such wonderful food as well as a fabulous views of London. Everything came together to make a great evening out: the view of course, a good buzzy atmosphere, live music and an exciting menu. Exciting food because everything was just a little different: tempting combinations that excited the tastebuds and made you feel you’d like pretty much anything on offer. It had been a long time since any of us had been there but we certainly won’t be leaving it such a long time until we return!